Are you forward thinking enough? I’m happy to say I was able to accomplish all of these goals and I did so by taking advantage of PrimalForms Community Edition. 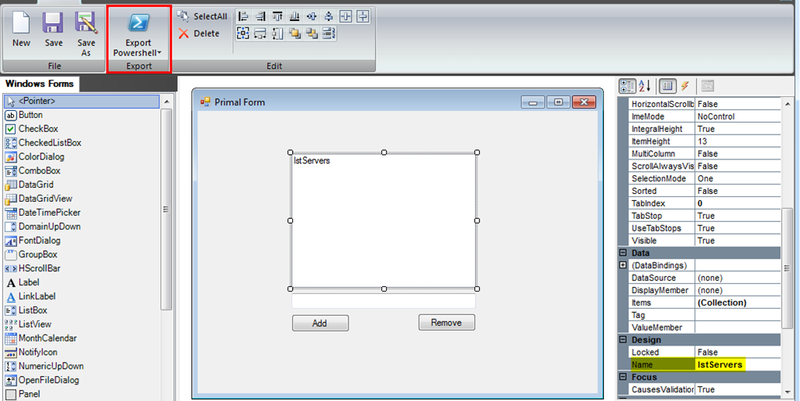 This is a free software put out by Sapien that allows for a drag and drop style interface for PowerShell UI creation. I suppose I should actually say “was a free software” however. It turns out that Sapien has discontinued the free version and rebranded the commercial iteration as PowerShell Studio and removed the links to the free version from their website. Fortunately, the free version is still available from other sources online. At the time of this writing, I was able to download version 1.0.6.0 from here. Now an important disclaimer. It turns out this software does not work with Windows 8/8.1. It’ll install fine but will never actually open. Some investigation reveals something to do with how it relies on .NET Framework 2.0 and how that’s changed in newer Windows releases. So if you’re going to use this, you’ll have to install it on a Windows 7 machine. In my case, I used a virtual machine. Once the software is installed, build the form the way you would like it, being sure to name your fields with a useful name as you will be referencing these in your PowerShell script to actually make this do something later. 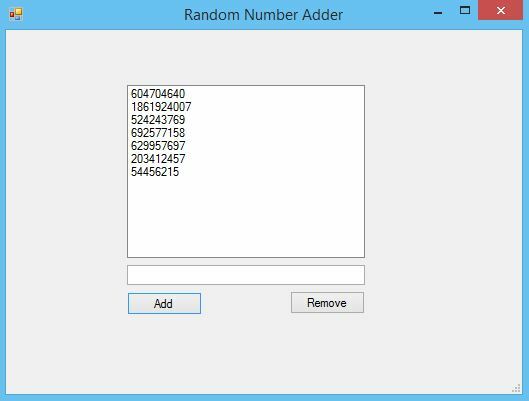 Note I have created a simple sample GUI below. It doesn’t do anything and is for illustrative purposes only. Once the form looks the way you’d like to to look, you should save the layout file. This will save in a .PFF extension and I recommend you keep this in the project directory for your script so you can easily modify it in the future. To actually add this layout to your PowerShell script however, you need to export the script using the Export Powershell button on the ribbon. You’ll have the option to export to a file or the clipboard. 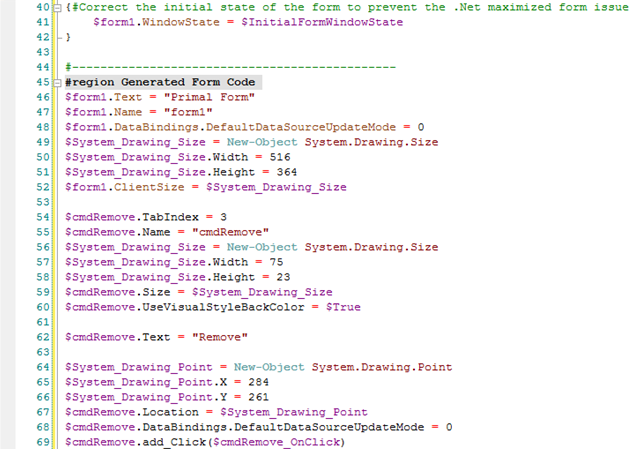 This is impressively everything you need as you can run this code directly in PowerShell and get your GUI on screen. However, as the code exists now, we’d have to add all of our business logic directly into this file. That would be fine except that if we decide we later need another element such as a button or a listbox, we’d have to generate a new file and carefully copy in our changes. That’s a recipe for frustration. So instead we’re going to turn the code that PrimalScript generates into a module and make it responsible only for window layouts and we’ll do our custom logic in a separate file. To accomplish this, we have to change a few things in the file. First, all of the windowed objects that PrimalScript generates are scoped to only exist inside a function. Since we need to access these in another file, we have to scope them differently. In my case, I have decided to scope them globally so they are available everywhere. I know this isn’t always best practice for programming but it fits all of my requirements here so we’ll run with it. The next thing we need to do is remove all of the OnClick events script blocks that it tries to initialize as we’re going to move those into our business logic file. Lastly, this script includes an execution of the function at the end of it and so we want to remove that. Now we can do everything I just said manually as it actually doesn’t take that long. But if you’re going to iterate through a design multiple times, that’s quickly going to get annoying which means it’s time to automate. Below is the PowerScript script I wrote that accomplishes the steps above. Disclaimer: This script has only been tested when using the Button, ListBox and Textbox controls. It’s possible other controls may alter the structure of the file and produce unexpected results. $OpenFileDialog.filter = "All Files (*.*)|*. *"
Note we are going out of our way to manually reload it if it’s already in memory as for testing purposes if you make changes, you don’t want to be using the obsolete version. Ok, now the absolute last thing we need to do is call the GUI form that PrimalForms generated so it will display to the screen. You do this simply calling the function at the very end of your script. The default name that PrimalForms generates is generateform. When we put it altogether, we can end up with a full graphical front end for your PowerShell script! i am beginning to code some powershell scripts. It is required for me to have a nice GUI. For a long time i am looking for the PrimalForms CE Edition. No link or anything is avaiable. Is there any way to get it from you ?!? However please note that if Sapien contacts me and requests that I remove the download, I will do so. PrimalForms CE is copyrighted software. You cannot host our software on your site for download. Please remove the download. It is unfortunate that a software is expressly called the “Community Edition” is no longer available to the community. But such is life I suppose. The software has been removed. @Shiron : Thanks , I already had it installed on my pc but lost he MSI , now i have it back. I have multiple list boxes, say ListBoxA and ListBoxB. I want to be able to drag and drop line items from ListBoxC to either ListBoxA or ListBoxB in Powershell.